Costa Rica is home to an estimated 25 species of whales and dolphins and is known for some of the best whale watching in the world. Each year, over a thousand or so humpback whales migrate from the California coast to the warmer waters of the Pacific Coast of Central America. It is believed that the reason they migrate to these warmer waters is to mate and wait for the birth of their calf. You’ll have a good chance of seeing Humpback whales all year round on either coast as a number of whales from the north Atlantic and St Lawrence Seaway take up residence in the Caribbean Sea as well. They are harder to spot however. Due to the awkward shape of the ocean floor, they’re rarely seen close the Costa Rican shore. Humpback whales gather in pods by the dozen in calving areas off the coast of the Osa Peninsula and in the waters protected by the Marino Ballena National Park. There is also recent evidence to suggest that there may be breeding groups in the Golfo Dulce and Papagayo Bay. At the same time the California humpback whales are escaping the North American winter, it’s cousin, the Antarctic whale is enjoying summer in the southern hemisphere. In June, when winter arrives in the south, Antarctic whales prepare for the longest migration in the animal kingdom and travel up north along the coasts of Chile and Ecuador to the warmer tropical waters in Central America, the same waters their cousins left just a few weeks prior. These whales travel an astonishing 3,000-5,000 miles EACH way, from both the Northern and Southern Hemispheres, making them one of the farthest migrating animals in the world. 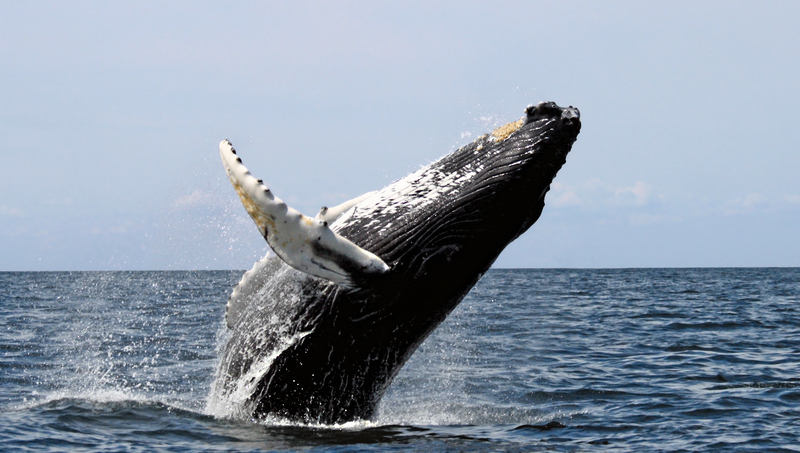 There are several companies offering Whale Watching tours located all over both coasts of Costa Rica. Most tours depart out of Drake or Carate on the shores of the Osa Peninsula or along the beaches of Ballena Park near the town of Uvita, the “Whale Tale of Costa Rica.” The best times are going to be from December to April for the California Humpback and then again from July to about November for the Antarctic whale. While the Humpback is going to be the star of the show because they spend so much time above the surface, make sure you keep your eyes peeled and your camera ready incase you spot a few of the other species that frequent these waters. Pseudo Orca’s, Sei, Beaked, Brydes, and Pilot Whales also swim in these warm waters. As migration continues, you’re also likely to see a few species of dolphins such as the Bottlenose, Spotted, Spinner, Common and Risso’s. If you share a passion for marine wildlife, consider the CEIC-Whale and Dolphin project, located in the Golfo Dulce, where you will have the chance to work side by side with researchers. It’s excellent for volunteers who are looking for a hands on experience and a deeper look into conservation issues related to whales and dolphins.